What Did Guitar Retreats Ever Do For Me? A personal review of the Guitar Retreats experience by a regular participant. As I sit down to write an article regarding my Guitar Retreats experience, I can’t help but think about that scene from the ‘Life of Brian’ when the question was asked ‘What did the Romans ever do for us’ and the answer turned out to be, ‘just about everything’! Well this just about sums up my article and I could end it right here, but I won’t as I suspect some readers would like a little further information. Perhaps I should begin by answering the most popular question posed by people considering attending a retreat for the first time ‘Am I good enough? Well the answer is certainly ‘yes’ enthusiasm is more valued than technical ability on a retreat, if you can manage at least two chords you’re there already. Let me describe my own experiences to explain further, prior to attending my first retreat down in Bude, I had no idea of where I was with my playing, I was a typical bedroom guitarist, learning from the Internet and Guitar magazines and CD’s, never played in front of anyone (too shy) and no one to give me feedback as to how I was doing, or where I needed to improve. I turned up for my first retreat that was billed as a ‘Beginners’ weekend. I had a great time, learned loads and met some really nice people who’s company I enjoyed immensely. As it turned out, I had underestimated my technical ability and was probably the best player there. When it came time for me to ‘perform’ a song, I was so nervous finding myself in such exalted company, my voice dried up and my fingers turned to rubber. But what happened next was awesome, everyone, starting with Sharon, (Stuart’s wife and a driving influence behind Guitar Retreats) joined in with my song, supporting me with enthusiasm and encouragement that lifted me up as never before, giving me my biggest boost of confidence just when I needed it. This attitude of encouragement is a ‘Signature Theme’ with Guitar Retreats and has continued on every retreat I have attended since, and quiet often, I receive as much information, help, guidance and playing tips from my fellow retreaters as I do from the designated tutors. And so it continued, I now play some finger style, sing and accompany myself on Guitar, I write my own songs, I am full of self confidence when performing in front of complete strangers, (though I hope I never lose that nagging nervousness that lasts right up to the moment I play the first chord, as I have come to recognise it as a pre-cursor to performing well for me). All of this has come about as a direct result of taking the plunge and attending my first retreat, and I’ve been on a few since! The course content is always relevant and described in full beforehand, the locations both at home and abroad are simply great, with my all time favourite being at ‘La Perdrix’ Riberac St, Martin in France that deserves a special mention from me. ‘La Perdrix’ is a 13th century converted monastery that is definitely not ‘The Premier Inn’. According to your taste, or sense of humour it can be described either as rustic or ramshackle, for me it is rural France at it’s best and a magical place that sets free your inner muse. I feel totally relaxed the minute I go through the gates! Johnny and his wife Ingrid and a team of lovely people run the place, and are as much a part of the retreat as the players. Check out the Guitar Retreat website for photographs. Now some of the more cynical of you reading this may well spot that I haven’t mentioned any negative aspects of a Guitar Retreat, well the simple answer is I personally haven’t come across anything worth mentioning. I do know, that if you deliberately look for the bad in anyone or anything you will find it, as it is there in all of us and everything. Genuinely, Guitar Retreats are a very positive experience and Stuart and Sharon welcome and are receptive to feedback. They do act to remedy any issues that occur either there or then, or as soon as possible after they are made aware. It can’t be that bad as a good 50% of attendees on a retreat are usually repeat offenders! And that includes me, I think I’m into double figures? (actually its now 20!) Does this make me biased, or am I smart enough to know when I’m onto a good thing? Only one way to find out! So go for it, any age, any gender, retired or escaping from the kids for a weekend of guitar playing, bring your wife or partner who will be made more than welcome. PS. I assure you all, no one paid me to write this but I do expect a beer from Stuart on the next retreat! We have run two guitar retreats since my last post, both in Cornwall – Our Blues weekend in Bude with Eddie Martin was well attended and well received, a masterclass in 12 bars, 3 chords and the truth! Last week myself, fellow tutor and ‘left hand man’ Paul Nicholas were back in the Scilly Isles on beautiful Tresco Island with a whole bunch of lovely people. The New Inn is a delightful venue and perfect for our needs. The simple unspoilt beauty of the island, it’s stunning botanical gardens and luxury spa make it a special place for partners too. Thankfully we just managed to avoid the recent crazy weather and made it there and back without any major issues, which is amazing when you consider we were flying out to an island in the Atlantic in tiny planes! There was a high standard of playing and singing amongst the guests which made the evenings particularly enjoyable and with the addition of the new Guitar Retreats Songbook on hand we had an absolute blast! We are looking forward to more dates there next year. “With a little help from my friends” I have created a songbook containing 50 well known songs with simple chord progressions. It is a really useful resource in the evening sessions, it means that everyone can join in playing a few songs together no matter what their level. What’s more if you come on a retreat this year you get to keep one for free! While we were on Tresco one of our lovely guests offered to create a short promo video with me talking about the Guitar Retreats experience. Many thanks to Andrea (who travelled all the way from Germany with her friend Simone) for filming and editing this video. If you have not yet been on a retreat I hope it gives you an insight into what we provide. You can view it here on our YouTube site, please like and share it: What happens on a Guitar Retreat? We have added two more events to the calendar. Freestyle Fun at Glewstone Court, Ross-On-Wye in November and our second Guitar Getaway to the Algarve next January. Thats all the news for this month. Don’t delay book your place today! Hello folks, we are back in Blighty after a wonderful time on our first retreat of 2018 in the sunsoaked Algarve! I have a strong feeling this event will become a regular feature in our yearly calendar! A post Christmas winter holiday with guitars, fun and sunshine, what’s not to like? We had a fantastic trip and played and sang our hearts out including a gig at a local bar and even a few impromptu sets in our hotel to an enthusiastic crowd of new fans! Well done and thank you to everyone who came out to join us and made it such a special trip. Back in Cornwall we have our next event coming up at the end of Feb 24th-26th with the one and only UK blues legend ‘Eddie Martin’ at the helm, revealing his “Secrets of the Blues” on our weekend retreat at An Mor Hotel. 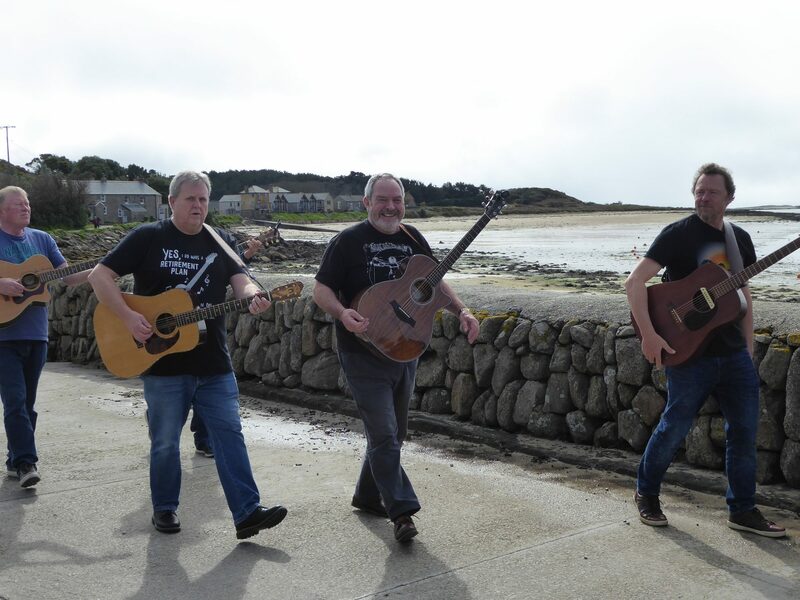 March – We return to the beautiful Scilly Isles for more guitar immersion and island exploration, plus evening jamming and open mic sessions! The material covered by myself and fellow tutor Paul Nicholas will be an eclectic mix of songs and styles both old and new. In April – We welcome back the amazing singer songwriter Alex Roberts with his “Fingerstyle and Open Tunings Weekend”. Not to be missed for those of you interested in expanding your knowledge and skills in this wide ranging genre. Alex will be teaching techniques used by the likes of Davey Graham, Bert Jansch, John Martyn, Nick Drake et all. June – We travel to France once again back at the magical La Perdrix for another “Freestyle fun in France” week of teaching, playing, singing and performing. This event has proved to be extremely popular and is always oversubscribed. September – We are also at La Perdrix for our “Guitar and Songwriting week ” for all you budding songsmiths out there . Come and write your first song or finish that difficult second album! No experience necessary, just bring the desire and a notebook and we will help you with the rest of the process. October – “The Rockstar Retreat”– Spain. Our latest week long international adventure of “guitar fun in the sun” with a recording studio session thrown in. I’m really happy to say this is selling out like hot tamales! Visit our website for all the details of this amazing music holiday. Well, that’s more than enough information to digest for this month I think! I hope to see you on retreat soon. I love the start of a new year and the possibilities that lie ahead, it is a time to re-invent yourself if only for a few weeks until old habits kick back in! A time to renew your commitment to a project or a cause or practise, such as learning to play the guitar better! With that in mind I have set myself a few challenges – 1) learn one new song every week, 2) attempt to master the use of a thumpick and 3) learn to perfect a classic rock solo! !………though I havent decided which one yet I can tell you it won’t be Stairway To Heaven! I am also re-reading a great book, ‘Zen Guitar’ by Philip Toshio Sudo that I discovered years ago and then gave away to another guitarist only to have it given to me as a present recently by a retreat regular (thanks again Brian 🙂 . It’s not a standard guitar teaching book in any way; there are no chord charts, scales or exercises. Instead it delves into the many different mental states we take on when playing and practising. It’s fascinating to read how famous guitarists think differently about the instrument and the what, why and when behind their playing style. It provides a fresh look at what can be achieved if you put your mind to it. I highly recommend getting hold of a copy. Of course there is no better way to get advice, inspiration and improve your playing than by attending a Guitar Retreat! So why not make it a new years resoloution to come along on one or two this year? Just making a booking will give you a push to practise more often! Seriously though if you are thinking of coming on an event this year don’t leave it too late to put a deposit on a place, we have limited spaces and they are already filling fast for 2018. All of our events were over subscribed last year and there were a few disappointed people. To those of you who missed out all I can say is don’t let that put you off – Carpe Diem! First up for 2018 we are really excited to be travelling to Portugal in two weeks time to start the year as we mean to continue with some fun in the sun with our guitars. Guitar Getaway In The Algarve Feeling spontaneous? Its not too late to join us! We will report back on all the shennanagins next month and we look forward to meeting up with many old and new faces this year. Until then cheerio and a Very Happy New Guitar Year! On my way to France for the 1st of our 3 week long retreats there this year. I’m taking this very cool and unique travel guitar. Massive thanks to Felix Byrne at Acoustic Guitar Innovation. His amazing handcrafted guitars not only sound great but are all designed to take on planes as hand luggage – perfect for your next guitar retreat abroad! R.I.P Chuck Berry. A true guitar legend who influenced almost everybody who picked up an electric guitar in the 50s and 60s right up to the present day. A larger than life character, he left us some great guitar riffs and songs that will last forever. Chuck Berry Retreat anybody!? We are very much looking forward to our next Acoustic Fingerstyle Weekend Retreat at Glewstone Court, Ross-on-Wye in a couple of weeks’ time. Again, sold out but we have another weekend booked there in November. Our Americana Guitar Retreat. Over that weekend we will learn many classic songs that define the term Americana by artists who have influenced so much popular music.We will study the guitar styles that make up this eclectic genre stretching back over 60 years. From Hank Williams to Johnny Cash, Bob Dylan and Paul Simon, from The Eagles, Neil Young and Joni Mitchell to The Doobie Brothers, Springsteen, Tom Petty and R.E.M. We even have a little ‘sweet soul music’ lined up to get you in the groove! We do have places available on our second Guitar and Songwriting Retreat in France. This is a week long residential retreat in a magical setting in The Dordogne, France, practicing the art and craft of songwriting for the guitarist. Over the week you will be taught and guided to complete your own compositions in the company of other budding songwriters. There will be heaps of guitar time too including lessons on creating interesting chord progressions and understanding the theory behind them. La Perdrix is a haven of creativity for all kinds of art and music and the perfect place to bring out your inner songwriter! Please have a look at our website for more information. We are currently looking into running more weekend events at new venues in the U.K. Including one back in Bude, Cornwall for an end of year bash in December. Watch this space. And finally the BIG NEWS! we mentioned last month …. fancy playing your guitar in the sun?….. in January?! Well here we go! : GUITAR GETAWAY IN THE ALGARVE available to book NOW!! Guitar Retreats are delighted to announce a stunning new venue for 2017 – Glewstone Court Country House Hotel near Ross on Wye in Herefordshire close to the Forest of Dean and situated in An Area of Outstanding Natural Beauty in the Wye Valley. This breathtaking 18th century country house is on on the English Heritage Register and is set in landscaped grounds on the Wales/Herefordshire border. The comfortable lounges are perfect for relaxed teaching, playing and jamming, there’s plenty of private space for one-to-one tuition and in the spring sunshine, the beautiful gardens are an ideal place to practice and relax. We look forward to welcoming you to join us on a Guitar Retreat here in 2017. Places are sure to go fast so don’t delay book today! The first date is set for the 7th of April in time for Spring in the Wye Valley. See the events page for all the details.